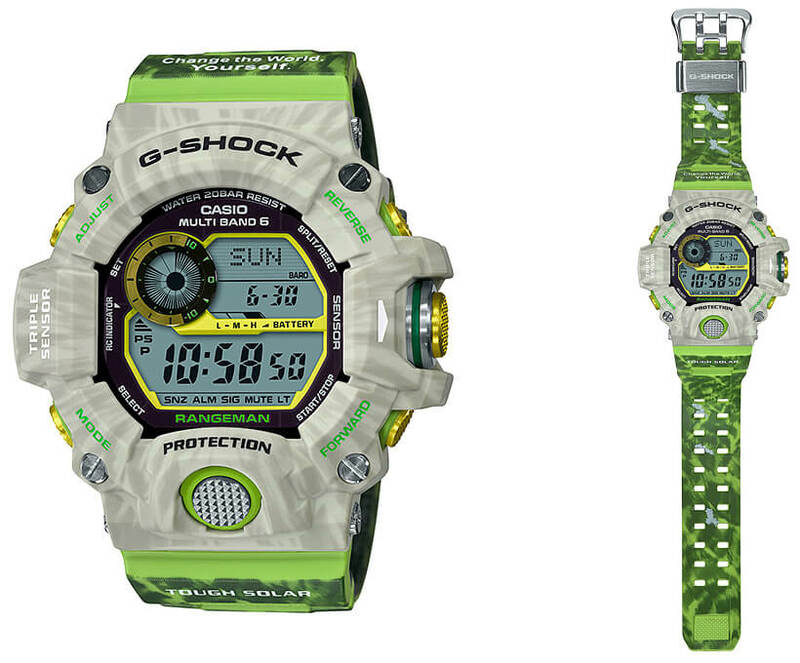 After a noticeable absence last year, the G-Shock GW-9400 Rangeman returns with a bang with the GW-9404KJ-3JR in collaboration with Boston-based environmental NGO Earthwatch as part of 2019’s Love The Sea And The Earth Series. Over the past few years Earthwatch-edition Rangeman watches have offered bold color schemes inspired by wild animals. This year’s model is no different with a multi-color design based on the kakapo parrot. 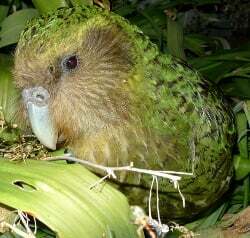 Also known as a “night parrot” or “owl parrot,” the kakapo is a large, flightless, and nocturnal bird that is endemic to New Zealand and critically endangered. 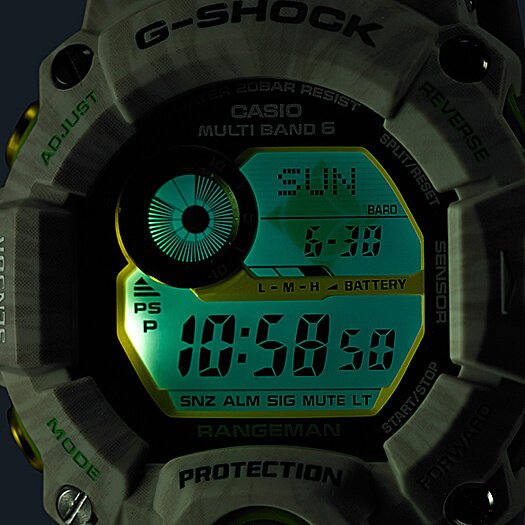 The bezel of the GW-9404KJ-3JR resembles the bird’s face with its light and dark streaks and the bands resemble the bird’s vivid green feathers. Other design elements include yellow accents on the face, gold IP buttons, and the Earthwatch logo on the LED backlight. 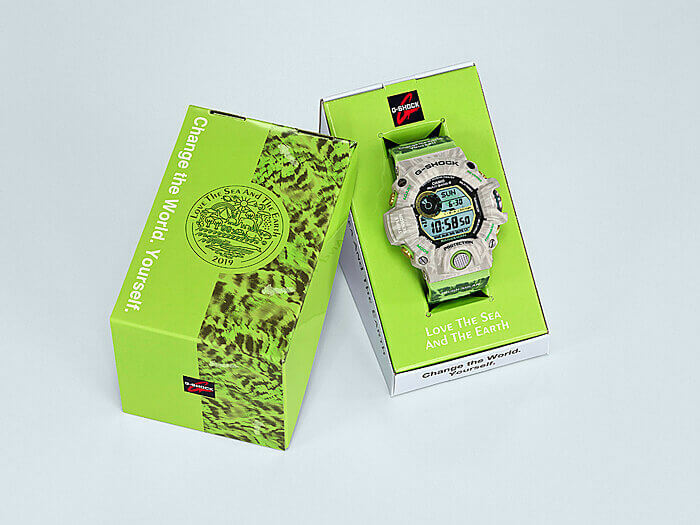 The GW-9404KJ-3JR also has a carbon fiber insert band and comes in exclusive Love The Sea And The Earth 2019 packaging. The GW-9404KJ-3JR Rangeman is a February 2019 release in Japan with a list price of ¥53,500 JPY. 2019’s Love The Sea And The Earth series also includes two other G-Shock watches and one Baby-G watch in collaboration with Wildlife Promising. The base Rangemen GW-9400 is a best-selling G-Shock survival watch featuring Tough Solar power, Multi-Band 6 timekeeping, and the Triple Sensor (altimeter-barometer, compass, and thermometer).